David Nicholls (known in the racing fraternity as ‘Dandy’), is a North Yorkshire based jockey, and former trainer. He has been labelled as the ‘King Of The Sprinters’, and has produced some exceptionally fast horses over the years. But is Nicholls a one trick pony? And does the assumption that he demonstrates a performance bias towards those horses running over sprint trips hold true? In this article, we take a look at all aspects of Nicholls performance as a trainer, identifying any trends in the process. Nicholls doesn’t have a large number of 2 year old debutants, but their record is profitable; 10/129 (7.75%) for a £24.75 LSP, giving an A/E of 1.38. 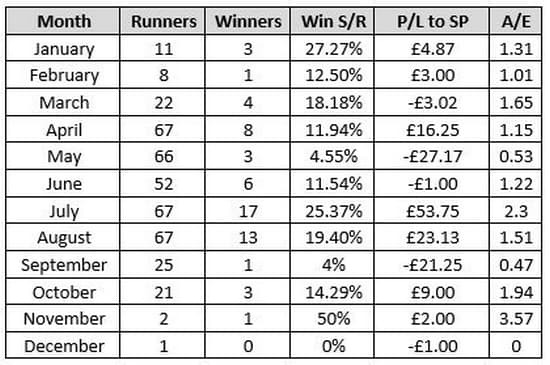 The strike rate isn’t prolific, but his runners produce a profit and a positive A/E. Common consensus is that Dandy Nicholls excels with his 2 year olds over the minimum trip, but whilst they do well, they actually perform best over 6f. 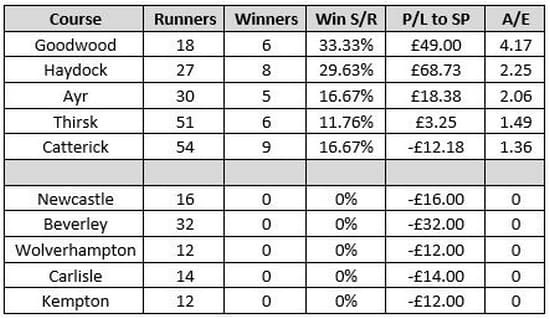 6f runners have a 17.02% strike rate, produce a huge £172.20 LSP and give an excellent A/E of 1.69. Those racing over 7f+ have a moderate record, so punters are best sticking with the runners over 5/6f in all types of races. The races at Goodwood and Haydock are normally strong and therefore it seems like he sends his best ones there. Newcastle and Beverley are both tracks that would be fairly local to Nicholls’ base, and therefore an overall record of 0/48 in the last 10 years is quite surprising. Those who have run 3 times and are moving from maiden to handicap company also have a poor record; 1/35 for loss of £-22. A/E 0.44 – Nicholls clearly doesn’t worry too much about getting his horses lowly rated for their first foray into handicap company. Horses off the track for longer generally have a lower strike rate, with the only time that Nicholls runners do poorly being when they are off for 91-150 days. The results validate this theory. Runners over 5-7f have much more runners, a higher strike rate and a positive A/E. Nicholls has a large number of runners in sellers and claimers. These races are typically where trainers can purchase and offload their lower grade horses. In claimers, his runners have an equally strong strike rate; 118/478 (24.69%) for £63.57 LSP, giving an A/E of 1.23. Nicholls runners really need respecting in both sellers and claimers. Nicholls has a modest strike rate with his first time out 2 year olds, but they are profitable and represent value. They do poorly second time out. His 2 year olds excel over 6f and are profitable for betting purposes. 2 year old runners who have had 5+ starts do very well. When Nicholls has runners at Goodwood and Haydock, they need respecting. He has nothad a 2 year old winner at Beverley or Newcastle in the last 10 years. Nicholls 3 year olds have an average strike rate on debut and don’t do particularly well in their first handful of runs on the racecourse. He has a superb record with 3 year olds in 3 year old only handicaps in July-August. 3 Year old+ handicappers generally do best when turned out within 3 weeks (and especially within a week). They are very profitable when returning to the track off a short time frame in Class 5 company. Nicholls runners do best over 5-7f and this is where he has the majority of his runners. His strike rate in sellers and claimers is impressive and his runners always need respecting in these races – especially when strong in the market.